A bunny runs for her life. The dog is gaining ground. So close his breath feels hot and his bark rings in her ears. My emotions entwine with the bunny’s. Heart-thumping, stomach-clenching, bone-piercing fear. My husband was surfing channels just as I walked past. I stopped and stood like a statue, waiting to see what was going to happen. I love dogs, and they were my best friends as a child, but in this picture I did not see the dog as a friend. I could only see myself from the perspective of the bunny as fear pounded in my ears and tightened up my muscles. Hurry, bunny! Run! Run! Relief flooded my veins as the bunny got to a hole where the dog couldn’t reach him. But the dog stuck its head in the hole and kept on barking fearlessly, ferociously, forcefully. Tension again, then “Whew!” He could only fit his head in. And yet he persisted, and I could almost feel the razor-sharp snap of his fangs. Bats swinging from above screeched and flapped, adding frightening notes to the scene. The dog was unrestrained while the poor bunny shrunk tiny against the back of the hole. Just out of reach. Then in a flash one bat swooped down and bit hard into the dog’s nose. Yelping in pain, the dog couldn’t get his head out fast enough. Apparently this was a prelude to a movie. I don’t know for sure, because my husband surfed on. I don’t know why, but for some reason I identified with the bunny. Maybe because my emotions have been more raw lately. I suppose the ominous music in the background didn’t help. I had to watch until the scene played out. I just had to root for the bunny’s safety. I just had to make certain he was out of danger. Okay, I know this is just a natural scene of everyday life, but it stirred up emotions in me. When deep emotions get triggered, I have to process why. So I stop and think as I sort this out. I know I often over-analyze, but this dog reminded me of the evil of a perpetrator and the devil himself (though I hate to think of a dog as a devil). The hole was the grace of God holding him back, not letting him reach me. I am the “bunny” running in fear from demons of the past, then scrambling for refuge in the arms of Jesus. I run in and the devil can no longer torment me. I cry out, “Jesus!” And the devil yelps and takes off with his tail between his legs. The bats? Ok, maybe they were just angry from being disturbed. But I like to think they were protecting the helpless bunny. Do you sometimes feel like this bunny? Flee to the wide open arms of Jesus. And you will be safe. The devil is a liar and loves to hit us in the vulnerable spots, shooting his arrows of lies into our thoughts. God describes him as always lurking and prowling around us, roaring like a lion, ready to devour us in a weak moment. But a comforting TRUTH is that Jesus has already conquered the devil. We are safe in His arms. Hi, Trudy. 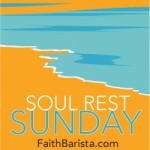 I stopped by via the Soul Rest Sundays link-up. Your title appealed to me, and I am happy to make one more “refuge” sighting here. Actually, two! (“Refuge” is my word for 2014.) As much as I love dogs, I also would identify with the bunny here, as perhaps the filmmakers intended. Thank you for reminding me what a sure and certain refuge my Savior’s arms are. The enemy can bark and roar as much as he likes, but he cannot touch me in the refuge of Yahweh for those in trouble. Grace and peace to you in our Lord Jesus Christ! May you find refuge in Him all this week. Thank you, Tinuviel. I appreciate your prayer and your stopping by. The enemy is roaring strongly today, but we will cling to our only Refuge no matter how much that enemy intimidates us, right? I hope you also may find refuge in Him all week! This is quite the story, Trudy…..Yes, the enemy does come against us, but Jesus is our defender…Jesus is our Refuge….Jesus is our Healer. He is our focus…our eyes on Him and obedience to Him is the best weapon of warfare..
Defender, Refuge, Healer… Amen. We would never be where we are today without Him, would we? Thank you, Renee.